I tried to manage my expectation of the movie but the word – Impressive, comes to mind after seeing Asurf Oluseyi’s Hakkunde. 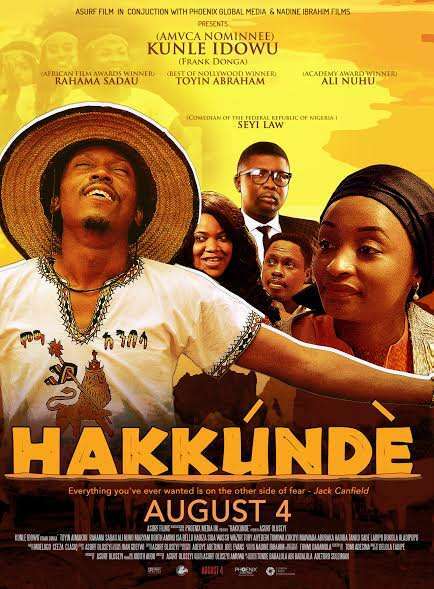 Hakkunde, an inspiring movie, shot in Lagos and Kadunna, is an enjoyable movie with a balance of comedy and drama. It follows the story of an unemployed young man, Akande. Four years after graduation, Akande (Frank Donga), living with his elder sister, Yewande (Toyin Abraham) has to deal with being unemployed, losing his girlfriend and his sister’s unending taunts. After Ibrahim (Ibrahim Daddy) saved his life from area hoodlums following an accident, Akande goes back to the okada riders park to pay his debt when he hears of a government grant for cow owners in Kaduna. Akande decides to go with Ibrahim as he promised to borrow him one of his cows in order to be eligible for the money. He steals/takes his sister’s money for transportation. Hakkunde doesn’t just portray the job hunting struggle in Nigeria but also, packed with messages, focusing on self-actualization and determination for young entrepreneurs and job creation. The film also tells in partial, Aisha’s (Rahama Sadau) story, however did very little justice on the other social issue it touched – Sickle Cell Anaemia. Aisha was accused by the community of ‘eating’ her husbands, who both died from the same symptoms. Few minutes of sensitization from the doctor would have done great justice to the film. However, the story is commendable for its angle. While I still try to understand if Maryam Booth’s role as Binta, Ibrahim’s sister, was meant to confuse us, convince us or keep us guessing, it is difficult to understand her true feeling towards Akande. Toyin Abraham was in her element as she cracks you up on every appearance. The casting for the movie is a major win, especially with the Northern actors delivering noteworthy performances. There are memorable magical shots in “Hakkunde” which captures the beauty of Northern Nigeria. Another memorable moment will be when the late Bukky Ajayi makes an appearance as Akande’s mother. But you wonder why there are cuts in a clip supposedly recorded by an old woman to help her son get a job on social media. The story overall shows the writer’s touch with reality – our reality. The film captures the familiar busy street of Lagos and the hustles therein. With great shots, inspiring messages and commendable performances from its cast, Asurf scores impressive with Hakkunde. “Hakkunde” opens in cinemas on August 4, 2017.